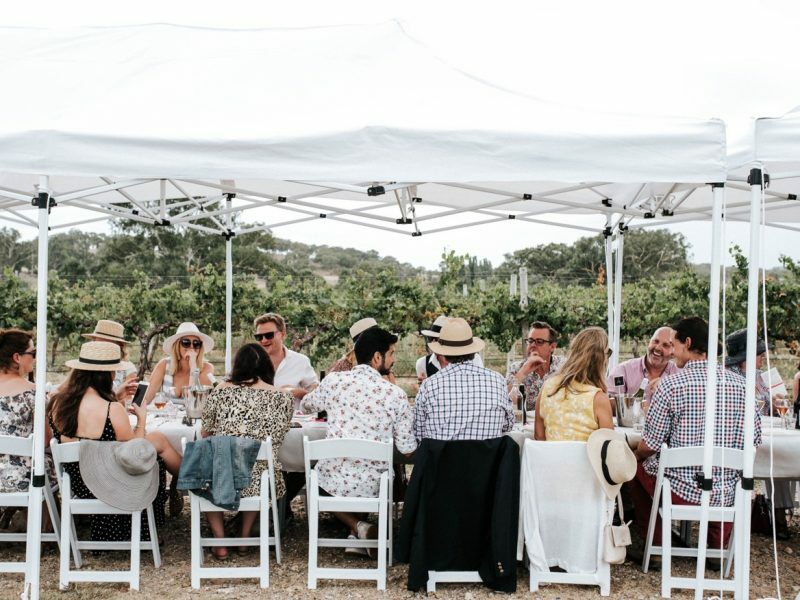 We know it’s not always possible to come to our cellar door, so continuing our focus on offering memorable wine and food experiences around Australia at some of our superb partner restaurants, we are delighted to announce the latest experiences for you to enjoy across May and June. 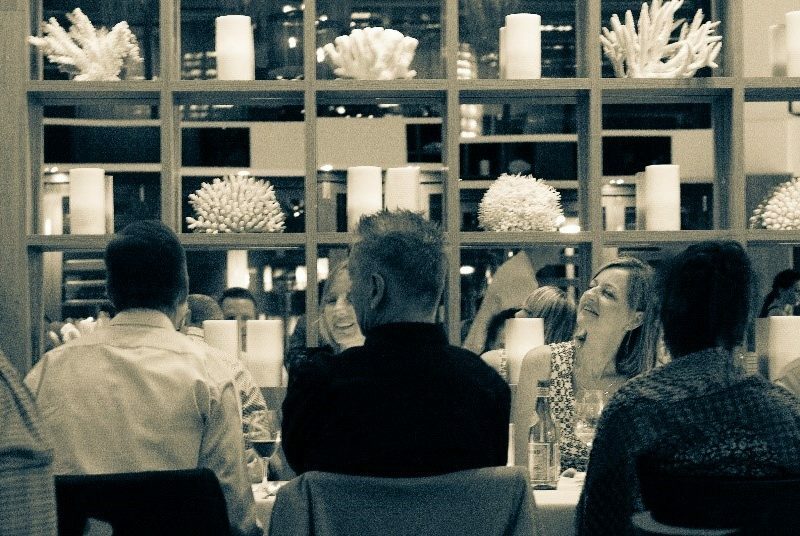 As many of you know, our wine dinners are a great mix of sensational food at some of Australia’s best restaurants, with a generous matching of our wines. We hope that you can join us! 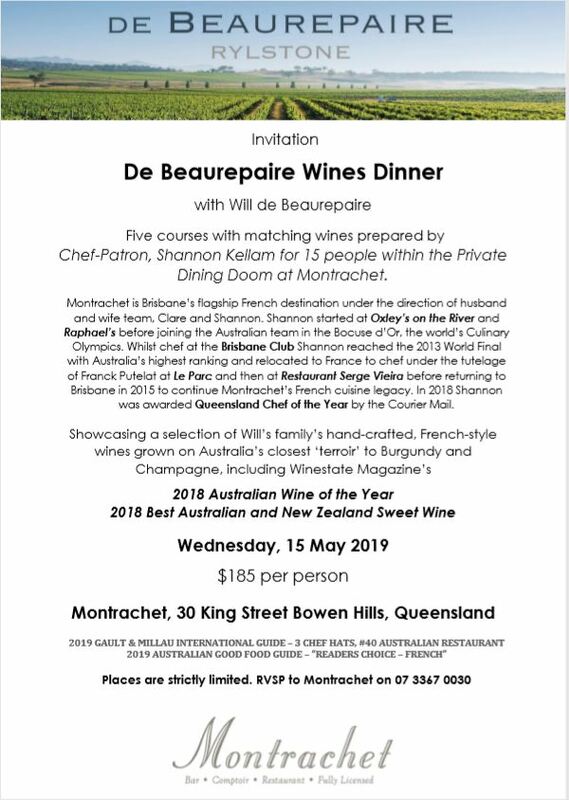 On Wednesday 15 May we are hosting an exclusive five course wine dinner for 15 people in the newly opened private dining room at Montrachet, Brisbane (3 hats Gault & Millau, #1 French Restaurant Queensland). 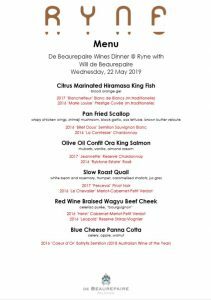 This degustation menu will be prepared by Chef Patron, Shannon Kellam, showcasing a selection of matching wines from our range of hand-crafted, French-style wines, including Winestate Magazine’s 2018 Australian Wine of the Year. When: Wednesday 15 May 2019. 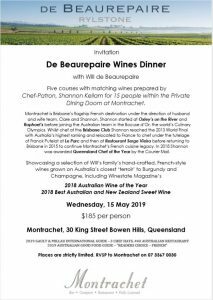 RSVP to Montrachet on 07 3367 0030. places are very limited, so we recommend booking quickly so as to not miss out. 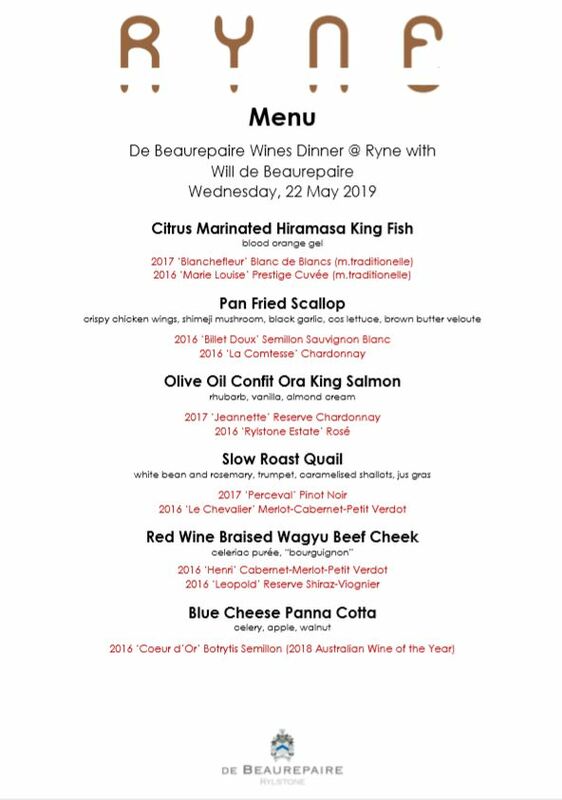 On Wednesday 22 May we are hosting a six course wine dinner at Ryne, Melbourne (3 hats Gault & Millau). 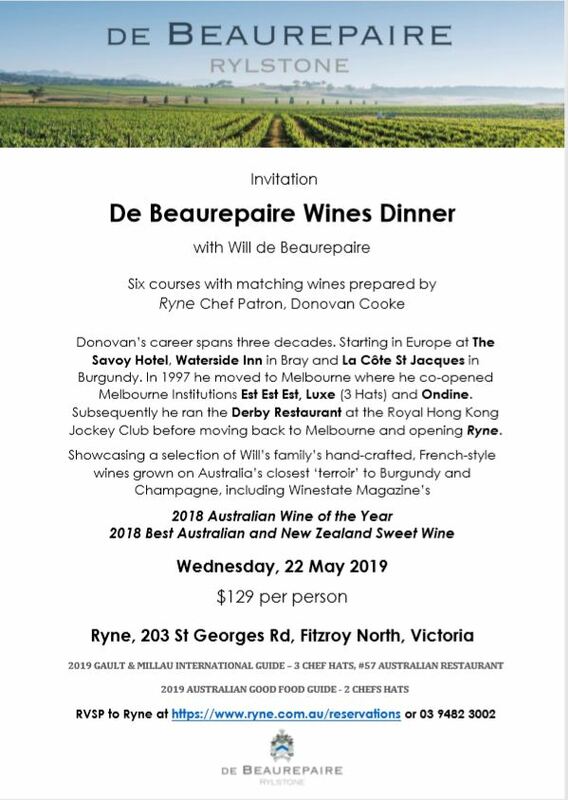 This degustation menu will be prepared by Melbourne legend, Chef Patron, Donovan Cooke, showcasing a selection of matching wines from our range of hand-crafted, French-style wines, including Winestate Magazine’s 2018 Australian Wine of the Year. Donovan’s career spans three decades. Starting in Europe at The Savoy Hotel, Waterside Inn in Bray and La Côte St Jacques in Burgundy. In 1997 he moved to Melbourne where he co-opened Melbourne Institutions Est Est Est, Luxe (3 Hats) and Ondine. 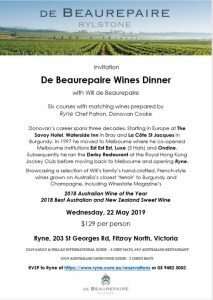 Subsequently he ran the Derby Restaurant at the Royal Hong Kong Jockey Club before moving back to Melbourne and opening Ryne. When: Wednesday 22 May 2019. 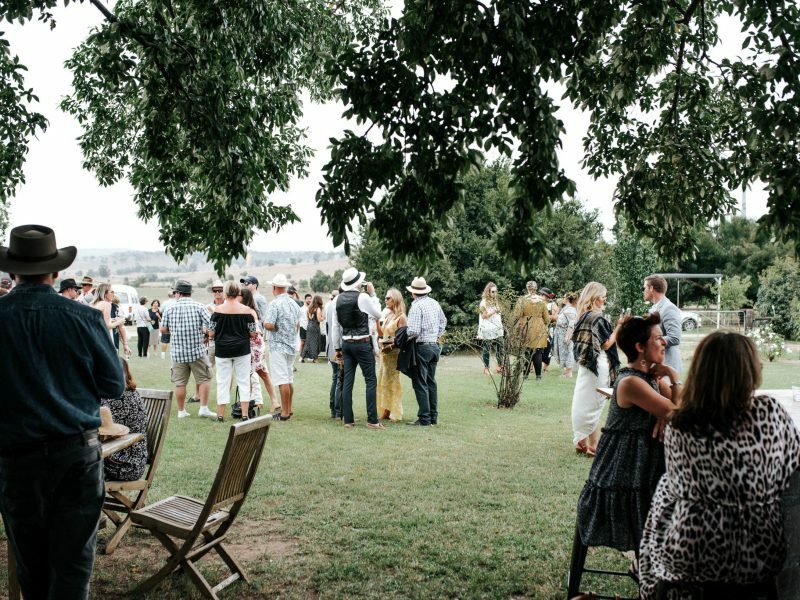 RSVP to Ryne on 03 9482 3002. Places are limited, so we recommend booking quickly so as to not miss out.